We at EduPristine are glad to let you know how US Certified Management Accountant Course (US CMA) – 6 Months Program is valued as the golden standard for Management Accountants will give you great credibility, opportunities and pay. The BIG MNC’s LOVE the CMAs: With increasing MNCs, financial services or consulting firms in India, the demand for US CMAs has gone tremendously high. Fortune 500 companies are known to have US CMAs in their key management roles. Companies like Alcoa, AT&T, Bank of America, Boeing, Cargill, Caterpillar, ConAgra, Hewlett-Packard, Johnson & Johnson, Microsoft, Procter & Gamble, KeyCorp, Whirlpool, Saudi Aramco, Verizon, Xerox are few top companies where US CMAs are hired. Truly Valued in India: As per a recent IMA Survey, CMAs enjoy 30%+ salary premium, that is more than non-CMAs in India. The salary offered in India ranges from 4 Lakhs to 20 Lakhs per annum, although experience matters in every field to directly affect your income. Check more information on CMA Course, see Pay scale for salary. 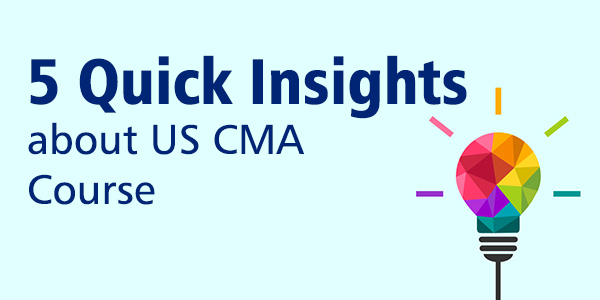 US CMA Jobs to die for: Few significant roles that US CMAs can work for are: Finance Manager, Financial Analyst, Financial Controller, Financial Accounting Manager, Deputy General Manager, Director Finance, CFO. Global Exposure: Earn international credibility with the highest qualification in management accountancy in the US which enjoys international recognition as members of IMA. Demand in All Major Business Areas: CMAs are wanted in Financial Accounting, Financial Risk Management, Management Consulting & Performance Management, Financial Planning, Financial Analysis, Corporate Finance (M&A, IPO, Share & Debt Issues), Venture Capital, Internal Auditing, Information Technology (especially as applied to accounting), Corporate Governance.